We have arrived. In front of the aerodrome is a place with suspicious wooden cabins on which we would have expected inscriptions other than “Garage”, “Grand International Buffet” and so on. Monstrous beggars, grown fat in their carts, stretch their arms towards us; it is tempting to jump over them as we hurry past. We overtake many people and many overtake us. We look up in the air, which is the main concern here. Thank God, nobody is flying yet. We don’t move out of the way but don’t get knocked down. Amongst the thousand vehicles jump the Italian cavalry. Neither order nor accident seems possible. One time in Brescia late in the evening, we want to get to a certain street, which we think is rather far away. A coachman demands 3 liras. We offer two. The coachman turns down the ride and, purely out of friendship, describes the almost terrifying distance to our destination. We become ashamed of our first offer. Okay, 3 liras. We get aboard, three turns of the wagon down short alleyways and we are where we wanted to be. Otto, much more energetic than both myself and our other companion, explains that he isn’t going to pay 3 liras for a ride that took less then a minute: one lira would be more than enough. Here is one lira. It is already dark, the alleyway is empty, the coachman is strong. He immediately flies into a rage as if the argument has been going on for an hour. “What? That is deception! What are you thinking? We agreed on 3 lira, 3 lira have to be paid, give me 3 lira or you have a shock coming.” Otto: “Show us the tariff or I’ll fetch the guards!” There is no tariff – where would there be a tariff? It was an agreement for a night journey, but if we give him 2 lira, he will let us go. Otto deepens the fear within us: “The tariff or the guards!” Further screaming and searching, then the tariff gets pulled out: nothing to see on it but dirt. Hence we agree on 1.50 lira and the coachman leaves along the narrow alley, in which he can’t turn around, not only angry but also melancholy, it seems to me. Regrettably, our behaviour was not in the right; you cannot act like that in Italy. Somewhere else it may be acceptable but not here. Oh well, who thinks about that when you’re in a rush. There is nothing to moan about – you can’t become an Italian in a weeklong trip. Regret shouldn’t spoil the pleasure of the aerodrome: that would only give us new regret, and we are jumping, with excitement in our bones, towards it. From time to time this excitement catches us suddenly, one after the other, under this sun. We pass the hangars, standing there with drawn curtains, like the closed stages of travelling performers. On their gabled roofs are the names of the pilots, along with the flags of their homeland. We read the names Cobianchi, Cagno, Calderara, Rougier, Curtiss, Moncher (a Tyrolean that wears Italian colours: he trusts them more than ours), Anzani, club of the Roman pilots. 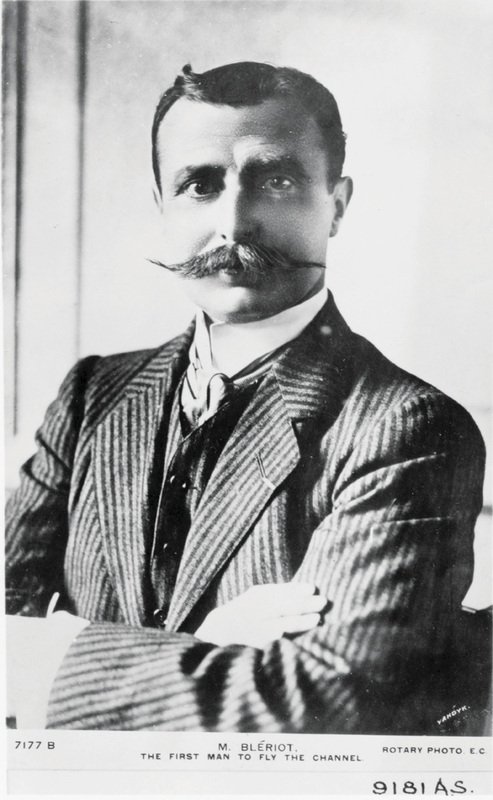 And Blériot, we ask? Blériot, the one we think about all the time? Where is Blériot? In the fenced area in front of his hangar, Rougier, a little man with a prominent nose, runs up and down in his shirtsleeves. He is engaged in an extreme, somewhat unclear activity, throwing out his arms, waving his hands, patting himself whilst walking everywhere; he sends his workers behind the curtain of the hangar, calls them back, goes himself, pushing everybody in front of him while his wife stands to the side in a tight, white dress, a black hat pressed firmly onto her head, legs set tenderly apart in a short skirt. She stares into the empty heat; a businesswoman with all the sorrows of business in her small head. Curtiss sits all alone in front of the adjacent hangar. Through a small gap in the curtains you can see his plane, bigger than we’ve been led to believe. As we walk past, Curtiss lifts the New York Herald in front of him and reads a line; we walk past again after half an hour, he is already holding the middle of the page, after another half an hour he is finished with the page and begins a new one. Apparently he doesn’t want to fly today. We turn and see the wide field. It is so big that everything on it seems lost: the finishing post close to us, the signal mast in the distance, the launch catapult somewhere on the right, a committee automobile with small yellow flags straining in the wind that describes an arc across the field, stopping in its own dust before driving again. An artificial wasteland has been established here in an almost tropical country, and the Italian aristocracy, the sparkling ladies from Paris amongst many thousands of others have all gathered to squint for hours into the sun. There is nothing on the square expanse that would usually bring variety to a sports field. It lacks the pretty hurdles of a horse race, the white lines of a tennis court, the fresh grass of a football field, the camber of a racetrack or a velodrome. Two or three times during the afternoon an array of coloured cavalry trots across the plains, the feet of the horses invisible in the dust. The flat sunlight doesn’t change until the fifth hour in the afternoon. There is no music to disturb the sight of the plains, only the whistling of the masses in the cheap seats trying to satisfy the needs of the ear and assuage impatience. From the expensive seats up above, the masses must seem to coalesce with the empty plain until they are one. At a certain point of the wooden banister a lot of people crowd together. “How small!” a French group sighs. What is happening here? We push our way through. Indeed, close by on the field there is a little yellowish aeroplane that is prepared for flying. 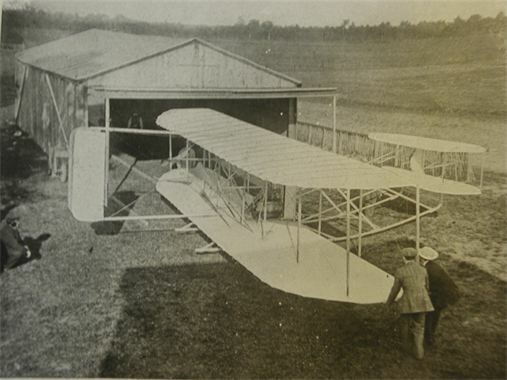 Now we can see Blériot’s hangar, beside that of his student Leblanc, built onto the field itself. We immediately spot Blériot, leaning against one of the two wings, and observe the head firm on his neck, his mechanics, how they work on the motor. One assistant grabs a wing of the propeller to turn it; he tugs on it, gives it a jerk. You can hear something like snoring. But the propeller doesn’t move any further. There is another attempt, they try it ten times; sometimes the propeller jams immediately, another time it moves for a couple of rotations. The problem is in the engine. New work begins. The audience is tiring more quickly than those closely involved in this operation. The engine is oiled from all sides, screws are loosened and tightened; a man runs into the hangar, fetches a replacement part; it still doesn’t fit; he rushes back and works on it cowering on the floor with a hammer between his legs. Blériot changes places with his mechanic, the mechanic with Leblanc. Soon they are tugging on the propeller one after the other. But the engine is merciless, like a student that the whole class is prompting: no, he can’t do it, he always gets stuck again, he always freezes at the same spot and fails. For a while Blériot just sits quietly in his seat, his six labourers standing around him perfectly still; they all seem to dream. The audience at once exhale and look around. The young Lady Blériot ,with a motherly face, comes over, trailing two children. When her husband can’t fly she doesn’t like it, but if he flies she is afraid. And, besides, her dress is a bit heavy for this temperature. The propeller is spun another time, maybe better than before, maybe not; the engine starts with a strange noise; four men hold the machine backwards and in the midst of the hot stasis a draft from the swinging propeller blows in waves through their overalls. You can’t hear a word; only the noise of the propeller seems to command. Eight hands release the machine which skids for a long time along the soil like someone clumsy on a polished floor. They make many attempts and all end unsuccessfully. Every attempt excites the audience, getting them up onto their straw chairs where they hold their balance with outstretched arms, expressing hope, fear and joy. But in the intervals the cream of Italian society wanders along the stands. They greet each other, bow to each other, recognise one another. There are embraces, they climb the steps to the higher seats and down again. They point one another out: the Principessa Laetitia Savoia Bonaparte, the Pricipessa Borghese, an elderly lady whose face has the colour of dark yellow grapes, the Contessa Morosini. Marcello Borghese is with all the ladies and none. He seems to have a comprehensible face from a distance, but from nearby his cheeks fall strangely over the corners of his mouth. 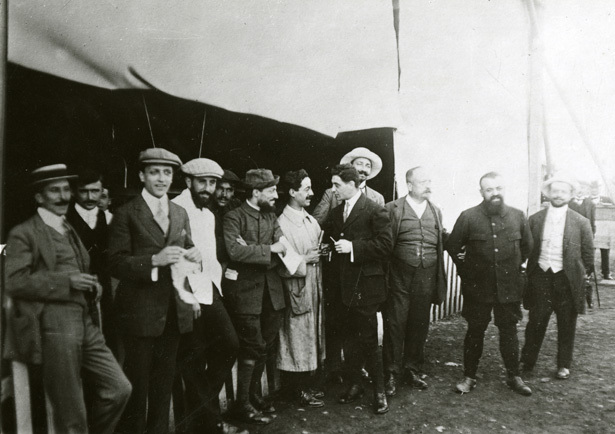 Gabriele D’Annunzio, small and weak, is seemingly dancing shyly in front of the Conte Oldofredi, one of the most significant gentlemen of the committee. From up on the tribune the strong face of Puccini looks down with a nose that you could call a drinker’s nose. But you only see these people if you look for them, for otherwise everything in sight is obliterated by the tall, apparently elongated ladies currently in fashion. They prefer walking to sitting: you can’t sit comfortably in their dresses. All faces, beneath Asian-style veils, are discovered as if in a dim gloaming. The style of dress, loose on the upper body, makes the whole shape look tentative from the back; a restless impression arises. The corsage lies deep, hardly elusive; the waist seems wider than usual because everything is slender; these women need to be embraced lower down. Only Leblanc’s plane has appeared so far. But now comes the plane in which Blériot crossed the channel. No one says it but everyone knows. A long pause and then Blériot is up in the air: you can see his straight torso above the wings. His legs are deep inside as if part of the machinery. The low sun illuminates the floating wings through the canopy of the stands. Everybody looks up at him with devotion; there is no room in any heart for anybody else. He flies a small circle and shows himself almost directly above us. And everybody cranes their necks to see how the monoplane balances, is steadied by Blériot then climbs some more. What happens then? Twenty metres above the earth a person is trapped in a wooden construction, fighting a voluntary and invisible danger. And we are down here, crowded and insubstantial, watching. Everything goes well. The signal mast shows that the wind has become more favourable and Curtiss will fly for the Grand Prize of Brescia. After all? Is this true? The second they agree on it, Curtiss revs his engine, barely visible, already flying away from us, flying across the expanding plain to the woods in the distance that rise towards him. He disappears. We watch the forest. From behind the houses he appears, God only knows how, flying at the same height as before, tearing towards us. When he soars you can see the underside of the plane tilting darkly; when he dips the top of it flashes in the sun. He rounds the signal mast and turns, nonchalant before the noise of the crowd, back to where he began, quickly becoming small and lonely again. He performs five of these circuits, flies 50 kilometres in 49 minutes 24 seconds and therefore wins the Grand Prize of Brescia: 30000 lira. It is a sublime victory, but sublime victories cannot be valued or in the end everybody would think they could achieve them; it would neglect the role of courage. But while Curtiss works his way alone above the forest, and while his evermore familiar wife continues to worry about him, the crowd almost forget him. 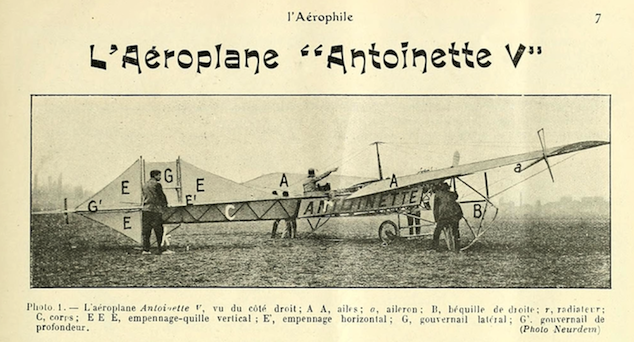 The complaint heard everywhere now is that Calderara isn’t flying (his machine broke down), that Rougier has spent two days working on his Voisin plane without leaving it alone, that Zodiac, the Italian “Zeppelin”, still hasn’t arrived. And there are so many forgiving rumours about Calderara’s misfortune that one might believe the love of a nation could lift him more securely into the air than his Wright plane. Curtiss hasn’t finished his flight yet and already the engines are sounding in three hangars. Wind and dust strike together from different directions. Two eyes are not enough. We turn, standing on our chairs, balancing, holding onto anybody, asking for forgiveness; everyone sways, grabs onto one another, exchanges thanks. The early evening of the Italian autumn begins; not everything on the field is clear now. 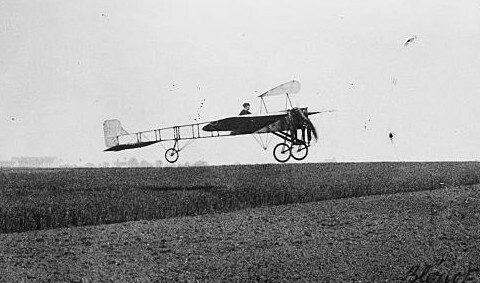 Just as Curtiss appears after his victory flight, taking off his hat with a little smile, Blériot begins a brief circuit that everybody already knows he can do! One isn’t sure if one is applauding Curtiss or Blériot or Rougier already, whose big and heavy machine is lifting into the air now. Rougier sits at his controls like a gentleman at his desk to whom one can come via a small ladder at his back. He ascends in small circles, flies over Blériot, makes him a spectator, and doesn’t stop rising. It is time to leave if we want to get another carriage. Many people are already rushing past us. One knows that this flight is only an experiment, because it is already past seven o’clock. It won’t be officially registered. The chauffeurs and servants stand on their seats in the atrium of the aerodrome and point at Rougier; the coachmen stand on the many carriages scattered in front of the aerodrome and point to Rougier; three overcrowded carriages are not moving because of Rougier. We are lucky enough to find an available carriage. The coachman sits down in front of us (there is no coach box) and finally we become self-sufficient individuals again. The ride begins. Max makes an excellent point: that you should and could host something like this in Prague too. It wouldn’t have to be a flight competition, he says, however profitable that may be, but inviting an aviator would surely be easy, and no one involved would have to regret it. 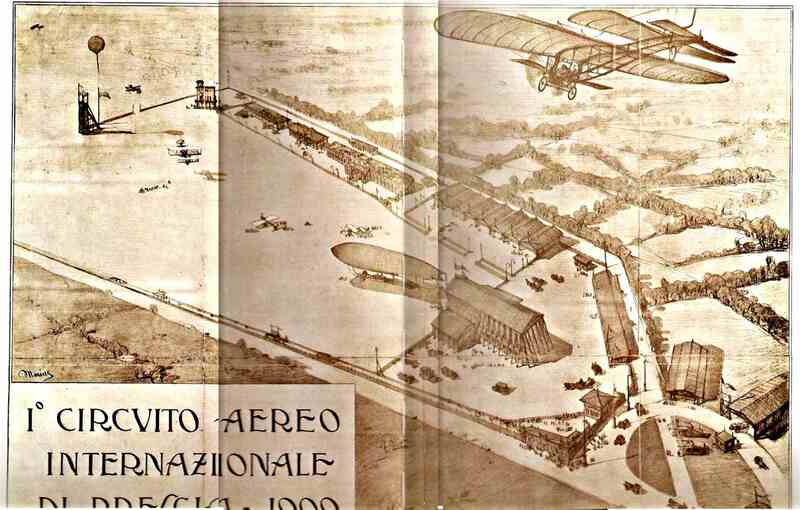 It would be so easy, now Wright flies in Berlin, Blériot is soon to appear in Vienna, Latham in Berlin. All you have to do is convince people to make a little detour. The rest of us don’t answer because we are tired and, besides, we agree. The path turns and Rougier appears so high above us it seems his position could only be described with reference to the stars now appearing in an ever-darkening sky. We have not stopped turning to see; Rougier is still climbing but we are finally moving deeper into the Campagna. Save this site: please donate using the button above or below to ensure we can carry on. Many thanks. 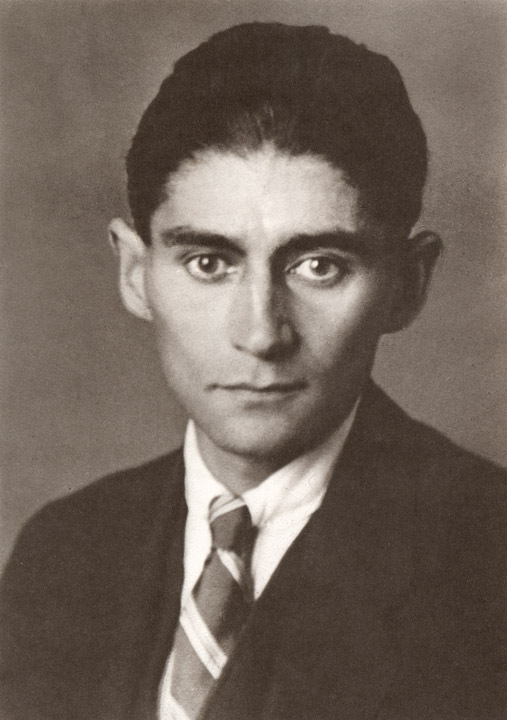 But I’m afraid the author, Franz Kafka, died in 1924- so may not be able to contact you. The photos are not said to be of the event itself. Hey I understand and absolutely an enthralled with your production. I enjoy your point of view. I live in Dayton and have published many books on aviation history. Looking for collaborators ?